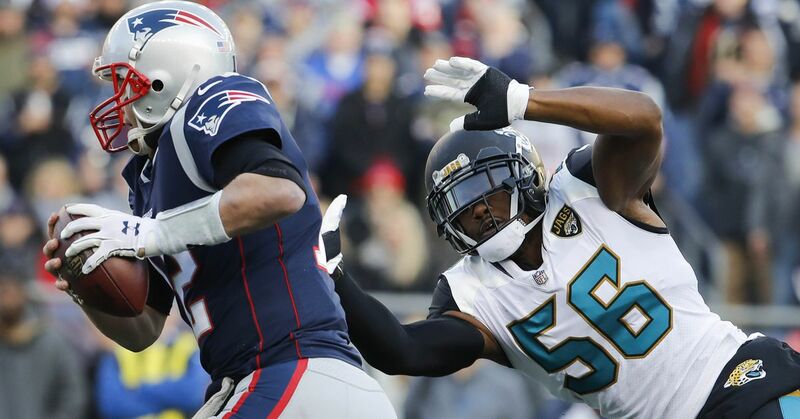 On Tuesday with the NFL trade deadline bearing down, the Los Angeles Rams traded for former Jacksonville Jaguars edge rusher Dante Fowler Jr.
Fowler was the third-overall pick in the 2015 NFL Draft, though he hasn’t panned out as hoped when the Jaguars spent the premium selection on him. Part of it wasn’t under his control (a torn ACL as a rookie), but he just hasn’t justified the price that was ultimately paid for him. For the Rams, that isn’t really an issue though. They didn’t invest the same amount in Fowler as the Jaguars did. All the Rams need Fowler to be is exactly what he is – a pass rusher who can provide plenty of speed and juice off the edge but will likely never reach the “elite” status that the Jaguars expected. Some could say that this trade may have a relation as far back as when the Rams traded highly-decorated veteran Ram Robert Quinn to the Miami Dolphins. It was evident at the time that Quinn simply wasn’t the same player he once was, but it was still an interesting development from the Rams as they ditched their best edge rusher by far. Many (myself included) agreed with the move as the opened cap space ($14m) allowed them to make many moves such as signing DT Ndamukong Suh, and trading for stars like CB Aqib Talib, CB Marcus Peters, and WR Brandin Cooks. Regardless, the Rams had to know they were heading into the 2018 NFL Draft with edge being a major weakness. And without premium draft capital due to trades for WR Brandin Cooks and WR Sammy Watkins along with the sanguine avoidance of panicking and overbuying at the edge, the Rams entered the season light on talent. This has borne out as Matt Longacre has yet to register a sack on the season and has been largely irrelevant. Running mate Samson Ebukam only has two sacks showing up sparingly. The remaining edge’s such as Morgan Fox and Dominique Easley are both on injured reserve while fan hopeful Ogbonnia Okoronkwo broke his foot in the offseason program and is still in the transition window off of the Physically Unable to Perform list. But that’s where Fowler comes in. For a team that’s got clear aspirations for a Super Bowl run this year, this was the right trade to make. Fowler immediately becomes the Rams’ best edge rusher and actually has proven to be a good player even without justifying his draft status. I watched all of Fowler’s film from this current year and came away relatively surprised and impressed. Lined up at LE on this snap, you can see the speed and bend around the edge right off the bat. Fowler is a very fast player which helps him threaten tackles as his speed rush is his go-to move and allows him to build his game off of it. This play may not look significant but I’ll show why its relevant as the RT knows he was beat. This time the speed rush and dip around the corner was very successful for Fowler. In the first clip Fowler only registered a pressure because it was a quick pass, but on this occasion Brady holds the ball and Fowler is able to knock the ball out for a strip-sack. Plays like this one are why players like Fowler are productive and dangerous as pass rushers. On multiple occasions (roughly 5 or 6) Fowler beat the RT with a speed rush or a variation of a speed rush. As he continued to beat the RT with speed, the tackle was bound to over-set and make up for his lack of speed. With Fowler knowing this was on the horizon, he came with an inside spin which would have worked to perfection had he not slipped. Watch Fowler here at LE. This is what his spin move looks like when he doesn’t slip. Nothing about this play is special, but his ability to stunt and rush from different spots and angles allows for his versatility to be capitalized upon. Defensive Coordinator Wade Phillips loves to run stunts, so it’s likely he’ll have some fun ideas and ways to maximize the production from Fowler. Oh, also, look how threatening his speed can be. Remember when I mentioned Quinn earlier? Doesn’t this rep remind you of what Quinn looked like last year in horns? Watching Fowler’s ability in-depth showed me what kind of player he really is and can be moving forward. In terms of production (not style), Fowler can be exactly what the doctor ordered with the Rams looking to fill the void of Quinn’s departure.